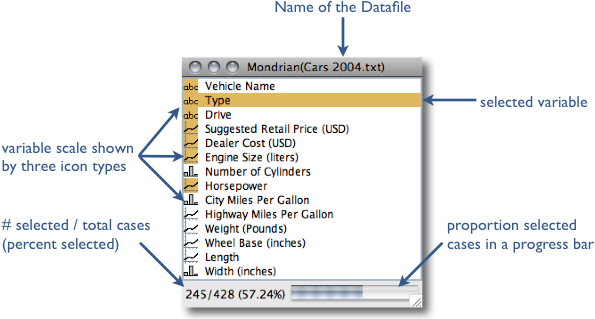 Mondrian works with data in standard tab-delimited or comma-separated ASCII files and can load data from R workspaces. There is basic support for working directly on data in Databases (please email for further info). 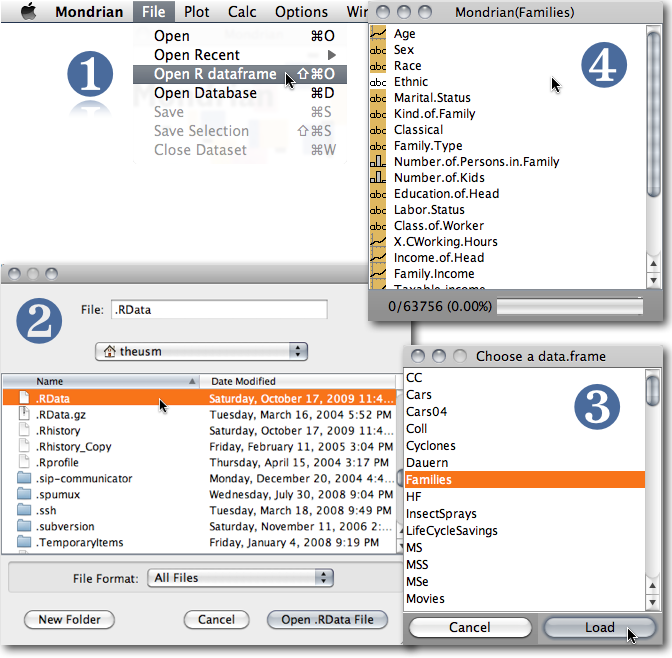 Mondrian is written in JAVA and is distributed as a native application (wrapper) for MacOS X and Windows. Linux users need to start the jar-file. The latest version can be downloaded here. If you have any questions or comments, please email mondrian@theusRus.de. Bugs may be submitted to the bug-tracker as well as per email. 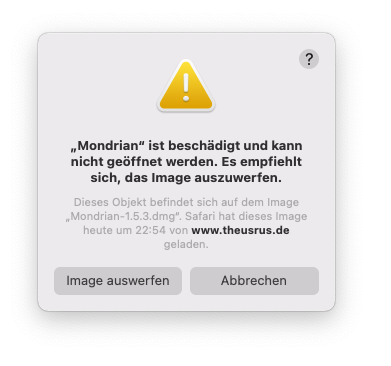 (03/11/17) Added a note to the Apple Security setting issue to make Mondrian start under Mac OS X 10.13 again. (08/29/13) New nightly build version 1.5b, fixing performance problems in very large maps and previewing the new universal importer. (07/31/13) Posted some sample demo videos created by Antony Unwin. Once we get some more videos, there will be a video section on this page! The scatterplotsmoother now includes "principle curves", which are one of the nonlinear generalizations of principal components. All smoothers can be plotted for subgroups, which have a color assigned, "smoother by colors". The color scheme has been refined once again, to make use of colors as efficiently as possible. The use of alpha-transparency is now consistent between scatterplots and parallel coordinate plots. New Transformations: columnwise minimum and maximum. Sorting of levels is now stable, i.e. levels which have the same value for an ordering criterion will keep their previous order. The order of the plot types now reflects their complexity. 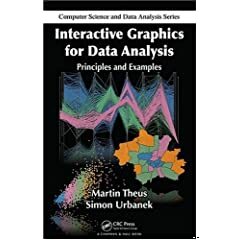 (09/10/09) The slides which go with the book "Interactive Graphics for Data Analysis – Principles and Examples" can now be found on the web. They should be a fruitful resource for everybody who wants to learn how to use Mondrian. (10/21/08) Finally "the Book" is out. It covers a 30 page Manual on Mondrian and nine real world case studies in the second part of the book. The first part introduces the most important concepts to get the most out of a tool like Mondrian. See www.interactivegraphics.org for more information. We choose to load the 'Tips' data from the sample datasets. For more info on the format of Mondrian datasets see the support section. Once you know how to create plots, create two barcharts for 'Gender' and 'Weekday'. Just click on 'Male' in the 'Gender' barchart and see the highlighting in the barchart of 'Weekday'. Use the context menu in the background (i.e., right click) to switch to a spineplot view in the barchart of 'Weekday'. Mouseover with CTRL pressed to see the information for 'Friday'. You can find more details in the book "Interactive Graphics for Data Analysis – Principles and Examples", but you should be up-and-running for now. Also take a look at the sample videos created by Antony Unwin, giving you a nice intro into how you can use Mondrian. The crucial issues in plotting histograms are to choose the ''right'' number of bins and the ''right'' origin of the first bin. 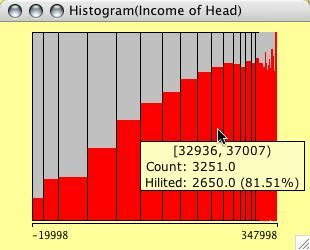 Since there are many rules and hints as to what ''right'' means under different assumptions, the most important interactive manipulations for histograms are changing the number (or width) of the bins and the origin. This is done by pushing the arrow keys (up and down changes the number of bins, and left and right moves the origin). In order to keep the visual distortion as small as possible, the scale of the histogram axis is not updated during the interactive reparametrization. Obviously the y-scale therefore represents probabilities and not counts. <meta>-0 adjusts the y-scale to the window size after the bin-width has been changed. The context menu allows you to set a fixed bin width and origin, either by using the suggested "rounded" values or by entering arbitrary values in the dialog box. 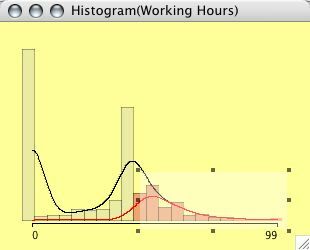 Furthermore, you may choose from two variations of the histogram, the spinogram and the CD-plot, both showing conditional distributions, which give a good idea of the distribution of a selected subsample. When Rserve and R are installed, density estimation will enhance the histograms greatly. 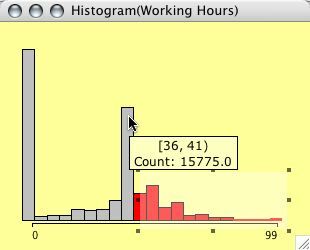 Histograms can be weighted. Select two continuous variables (the weights usually should be positive, although Mondrian will not complain about negative weights) and choose weighted Histogram from the plot menu. 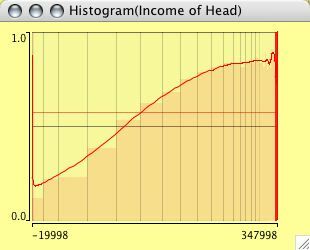 The example shows a typical situation for weighting in a histogram. 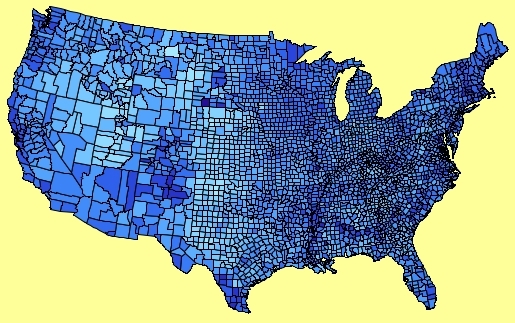 The left plot shows the distribution of %blacks for the US Midwest counties. 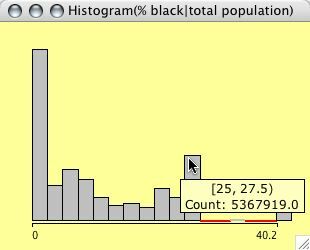 The right plot is weighted with the total population, thus showing us the number of people living in areas with a certain % of blacks. 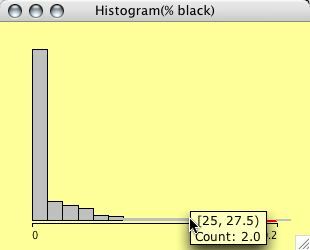 current binwidth of the histogram itself. Boxplots y by x are for a single continuous variable, split by a second categorical variable. To invoke a boxplot y by x select the continuous variable to plot and the categorical variable to split by and select 'Boxplot y by x' in the 'Plots' menu. Manual reordering of the classes is possible by reordering the levels in a corresponding barchart. 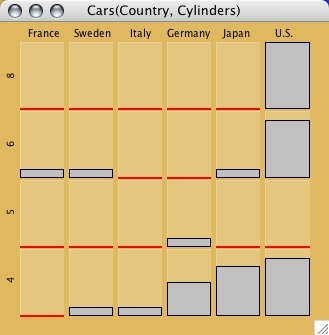 Boxplots y by x for the cars data set - heavy cars selected. 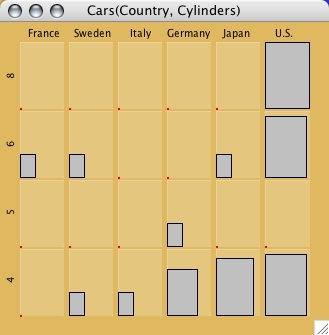 Parallel boxplots are very similar to parallel coordinate plots, and share most of their functionality. 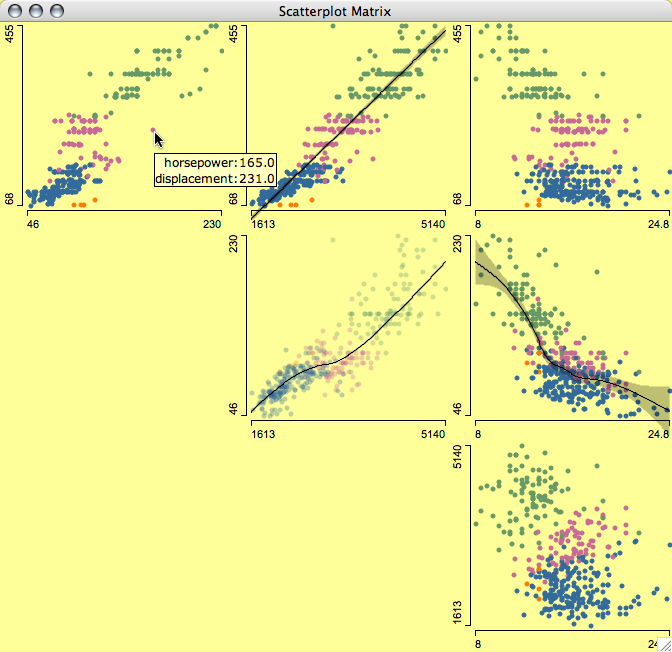 Scatterplots offer all basic interactions: data can be selected and highlighted, the scale can be zoomed. In contrast to other plots in Mondrian, scatterplots offer axis information, showing the maximum and minimum for orientation. 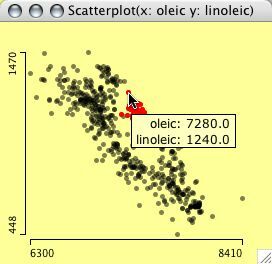 Query methods for scatterplots operate on three levels. The first level simply gives the position of the cursor, which is displayed as a projection on the x- and y-axes. This query is invoked by pressing the alt key. Pressing control invokes the second level of querying. 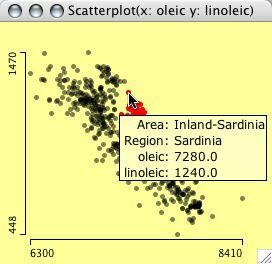 A tooltip is presented with the data of the variables in the plot for the points at the cursor. If more than one point is found at the same distance, a list of the cases is presented in the tool tip. Holding shift and control shows the information of any selected variables in the variables list, i.e., an extended query showing data, which are not displayed in the plot. 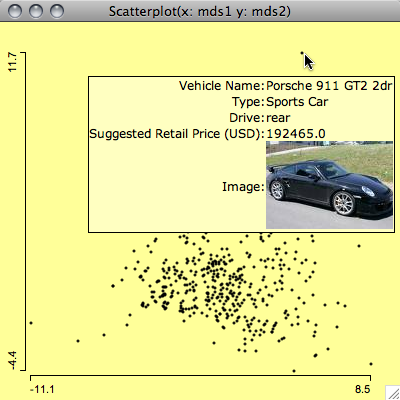 Example of an image query which shows a photo of the car, which turned out to be an outlier in the MDS. In many cases it is very helpful to get additional information for an object, which might only be captured in an image, e.g. a chemical structure or a movie poster. Mondrian allows you to specify a URL for an image location for each case. This can be an entire URL for every case, or a URL composed of a common part and a case specifc part. The common part of the URL is coded in the column name, the case specific part is the entry in the column. The format is as follows: A column holding image URLs must start with '/U'. If there is a common part, it follows after the prefix. The position where the individual entry of the case goes is enclosed with '<' and '>'; this also defines the column name. In the example, the column header could as well be '/U<Image>' and each entry could contain the complete path, i.e. 'http://www.apple-history.com/images/models/...', though it would be far less efficient. To control the amount of smoothing, use <shift> up/down arrow. There is an option to compare the highlighted smoother either to all data or to the complement. If colors are defined via color brushing or direct color assignment, smoothers are shown for all colored subgroups. 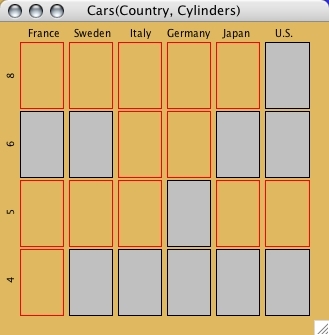 Barcharts in Mondrian follow a vertical layout, not the traditional horizontal layout. Thus the category-names can be printed in full (in most cases). A barchart for the Titanic dataset. First class passenger are highlighted. 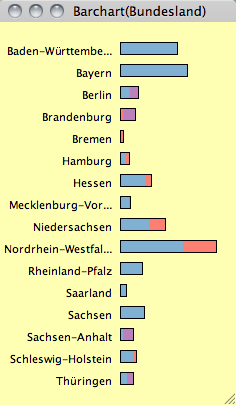 Barcharts can be switched to spineplots, which makes it possible to compare highlighted proportions in the selection. When a barchart has very many categories, it can be hard to search particular items, especially if the barchart is sorted to something else than lexicographical order. You may type a prefix of the item you are looking for, and Mondrian will automatically scroll to that item. 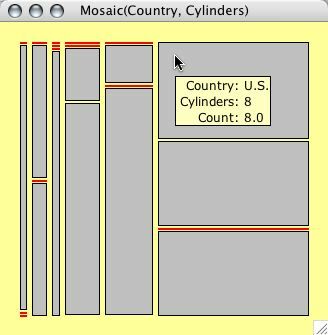 Mosaicplots in Mondrian are fully interactive. 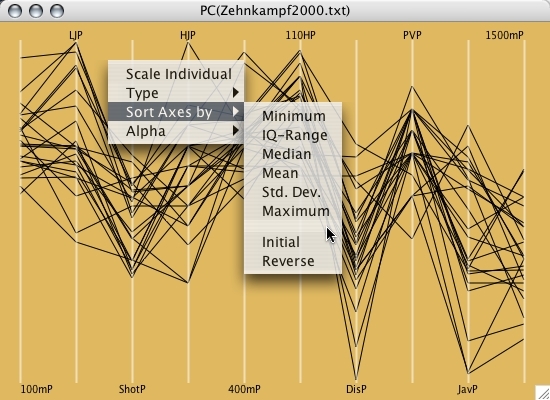 Interactivity includes the standard operations described in the convention section (except zooming), plus reordering of the plot variables using the 4 arrow keys. Use <meta>-r to rotate the direction along which the last variable in the plot is split. Use <meta>-+ and <meta>-- to add and delete interactions during the modeling process using the ModelNavigator. During the model process one may want to use the plot option to show the expected values of the model and not the observed values. 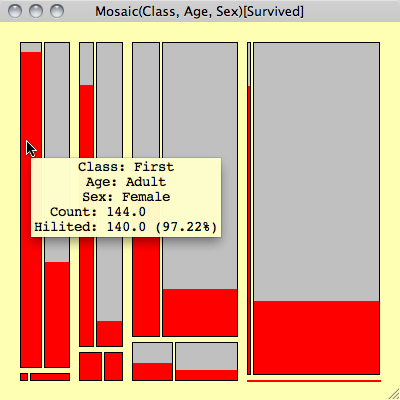 The picture below shows an example from the Titanic dataset, which includes information on the class (1,2,3 crew), age (child, adult) and gender (male, female) of the passengers. Surviving passengers are highlighted. Although there are no labels to decode the cells, the order of the variables is given in the title of the window. Using interactive querying it is easy to check what the cells represent. In this static representation the fact that there are no children and hardly any women in the crew, should be sufficient to decode the plot. Example of a rotated Mosaic plot, i.e. first variable is split along y not x. These plots show the five different variations of mosaicplots. Whereas the first two options are "real" mosaicplots, the other three versions (same bin size, fluctuation diagram and multiple barchart) are more useful for handling only a few variables with many categories, which is the worst case for a standard mosaicplot. For these three variations, Mondrian plots the category labels for the first two variables, since the categories are equally spaced and so can be easily labelled. By typing shift-up-arrow and shift-down-arrow, the size of boxes can be zoomed. As soon as a box reaches its maximum size, it is red-framed to indicate the incorrect size. If the dataset has missing values, a missing value plot can be used to analyze the structure of the missing values (monotone missingness etc.). In a missing value plot, only those variables are shown, which actually have missings. Missing values MUST BE CODED AS "NA"!! Mondrian implements parallel coordinate plots for an arbitrary number of variables. Alphanumerical categorical variables are displayed equally spaced according to the currently defined order. Numerical variables are scaled according to their actual numbers. Adjust α-level of lines via the context-menu or the left and right arrow keys. Type PAGE-UP or PAGE-DOWN repeatedly to cycle through the minimum number of orderings for seeing ALL adjacencies of the variables in the plot. Selections can only be performed on axes not on lines. If a plot with many variables doesn't fit the screen, use meta-0 to fit to screen size. 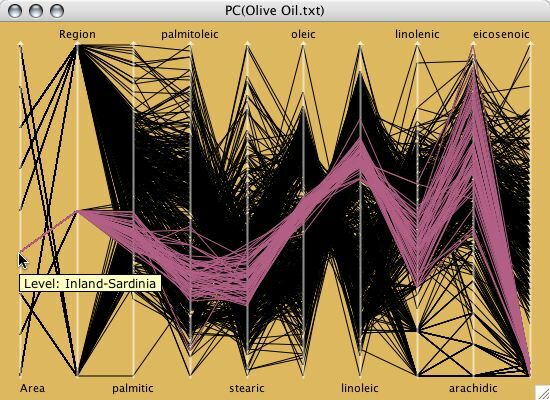 A parallel coordinate plot for the olive oil data. A parallel box plot for the olive oil data. Case: If a single case is selected, this case is used as the reference. Value ...: Enter a desired value. The last four settings use +/- 3 sigma or IQR as scaling. Use arrow key <up> and <down> to increase or decrease the scale. SPLOMs (ScatterPLOtMatrix) in Mondrian are "only" a collection of standard scatterplots, efficiently arranged in a single frame. Thus it has the disadvantage that all keyboard shortcuts apply to all panels simultaneously, but the advantage that each panel is a fully featured scatterplot. SPLOMs are quite effective for a quick 2-d overview, but are inefficient when working with more then just a few variables. In the case of many variables, parallel coordinate plots are far more effective. Whenever a dataset contains information by regions, Mondrian can draw interactive maps if the regions are available as polygons in a separate map file. A corresponding data record must be provided for each polygon defined in the dataset. Different polygons might point to the same data record, but multiple records to a set of polygons are ignored. Maps offer the standard selection and querying tools. Additionally the standard zooming function of Mondrian is available. 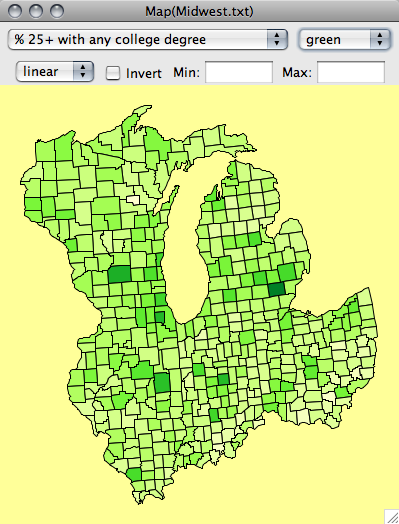 All maps have a popup-menu at the top to create a choropleth map of any of the variables. "blue to white to red"
The saturation (more precisely the alpha) of boundaries can now be changed with the right arrow key (more saturation) or left arror key (less saturation). This can change the perception of the map drastically, so make sure to test it out! Selections in Mondrian can be made in two ways. These two selection modes can be selected in the option menu (or by pressing <meta>-m) to switch selection sequences either on or off. The default is off. Simple selections are performed as any selection in the operating system's desktop. A new selection replaces the current selection. Holding down the <shift> key will combine the new selection with the currently selected data in XOR-mode. Holding down <shift> and <alt> will perform a selection in extended mode, which is AND by default, but can also be changed to OR in the Options menu. When using Selection Sequences, any selection is recorded. 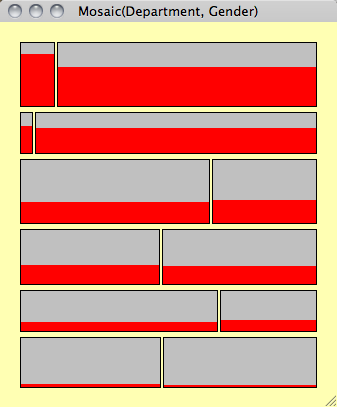 The selection is represented by a transparent rectangle with 8 handles. Use any of these handles to resize the rectangle (slice) or click-drag the rectangle to move (brush). The popup-context menu on a selection rectangle will indicate the selection step and offer the choice of changing to a different selection mode (union, intersection, negation, xor), of deleting this step, or of deleting the complete sequence. Deleting a single step can also be performed by <backspace>. Use <meta-backspace> to delete the complete sequence. To query objects covered by a selection rectangle hold down the <shift> key to click through the rectangle. Selection Sequences can span across plots and more than just one selection can be made per plot. To keep track of the selections made, all selections are annotated in the windows menu, just behind the window title, i.e. 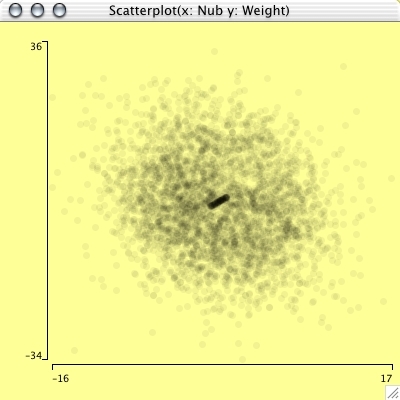 "Scatterplot(x,y)  " tells us that selection steps 2 and 4 have been made in the scatterplot of the variables x and y. Use <meta>-a to select all cases. A map with two sample selections of a Selection Sequence. The first selection (south east states) always defaults to "replace" mode. The second selection (north west states) is queried with the context menu and the mode is switched from XOR to OR. Note: Deleting all selections is not limited to the current plot window. 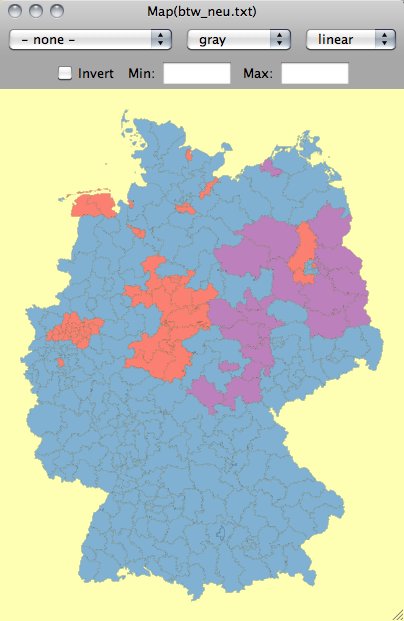 The map of the German electoral districts is colored according to the party winning the most votes in 2009. The barchart shows the same coloring for the different states. To clear all colors use either the (context) menu option or press <alt>-<meta>-b. Whereas overplotting is no problem for highlighting (highlighted cases are alway plotted on top) the overplotting issue with multiple colors can not be resolved satisfactorily (α-transparency won't work well here). The key to a smooth and efficient user interface is a set of conventions. Once the user has learned the basic operations like selection, querying, zooming and reformatting, she can perform them in any plot. In an interactive graphical system, possible interactions can be carried out with mouse and keyboard. Since JAVA programs are not bound to a specific platform, Mondrian tries to only makes use of features, which can be found on all platforms. There are some restrictions like the one-button-mouse for most MAC-users (Steve give us the right button!!). The most commonly found modifier keys are SHIFT, CONTROL, ALT and META. CONTROL is blocked as the popup-trigger on the Macintosh, META misused under Windows and ALT blocked by many window-managers under Linux. If possible, interactions with objects should use existing user knowledge. E.g., the resize operation of a selection rectangle in Mondrian is performed by dragging on one of the eight handles. This operation is well known from object based layout software such as Adobe Illustrator or QuarkXPress. The α-channel can be used to specify the transparency of a painted object. This is very useful, when plotting many objects, as then heavy overplotting can occur. In this way the density of objects can be approximately displayed. 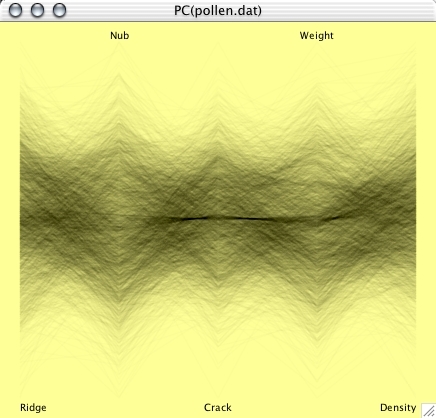 The figures below show an application using the well known "pollen" dataset. The darker string in the parallel coordinate plot above is actually the word "EUREKA", which was included in the artificial dataset. 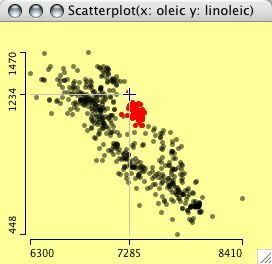 Zooming the scatterplot below would show us the 6 letters of the word. 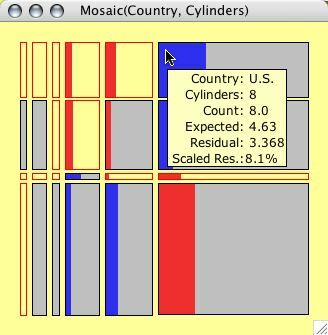 Although Mondrian was not designed to support statistical modeling of datasets, a graphical modeling technique for categorical data using mosaicplots is built in. The so-called ModelNavigator allows a stepwise graphical modeling of loglinear models. The ModelNavigator basically inverts the use of graphs and models. Whereas packages like R or S-Plus usually assume a model, for which diagnostic plots can be plotted, the approach in Mondrian starts with a graph, then sets up a model, and uses the statistical measures as diagnostics, to check the graphical conclusions. For a more precise description of this technique see the paper on Visualization of Loglinear Models. 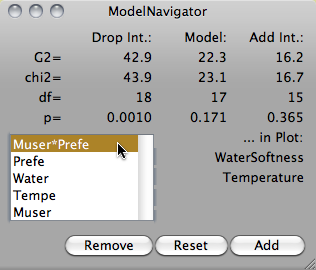 The figure below shows the ModelNavigator used to model the Detergent dataset, often used to illustrate loglinear models for 3 and more variables. Mondrian supports the standard ASCII data format, which consists of a header line of variable names and tab-delimited columns. Since Mondrian determines the format of a column automatically (continuous or categorical), the specification can be overridden by putting a '/C' for continuous and a '/D' for discrete as a prefix in front of the variable name. Double click (or use <meta>-T if you need to change more than one variable) a continuous variable ( ) to change it to be categorical ( ). Vice versa double click to change to . Alphanumerical variables are tagged as and cannot be changed to another type. To get a fast and effective overview of which variables have missings, there are 'white'-versions of the icons of all three types, i.e. , and indicating at least one missing in the particular variable. When working with very many variables, just type the prefix of a variable name to search for a particular variable and to make the variable window select all those variables and also scroll to the first hit. Polygon Data must be stored in a separate map file. The dataset must include one variable of references, which the polygons refer to. This variable must start with '/P'. If a dataset is asociated with polygons, there must be an empty line after the data matrix followed by the relative path+filename to the file containing the map data. where id is the matching id from the reference variable. Name can be any arbitrary string naming the polygon. n is the number of points in the polygon. This header is followed by x and y coordinates defining the polygon - separated by tabs, one pair per line. The first and last coordinates must match, i.e. the polygon must be closed. Mondrian supports loading data directly from R workspaces. To do so, you only need to specify the R workspace file (in most cases it will default to .RData). Once the workspace file is chosen, Mondrian lists all dataframes within this workspace. Selecting the desired dataframe will dump a temporary file from R and read this file into Mondrian. The development version of Mondrian allows the connection to databases via the JDBC interface. Currently this type of connection, which leaves the data entirely inside the database, is under further development and is thus not available in the latest releases. There is no doubt, that computations and transformations of data are better done in R than in Mondrian. Nonetheless, there are some basic transformations we want to be able to perform within Mondrian, without being forced to go to R.
Data set on the 2201 passengers and crew of the Titanic. Purely categorical with data on class, gender, age and survival. Fake data set with hidden feature, which is easily found with α-channel features. 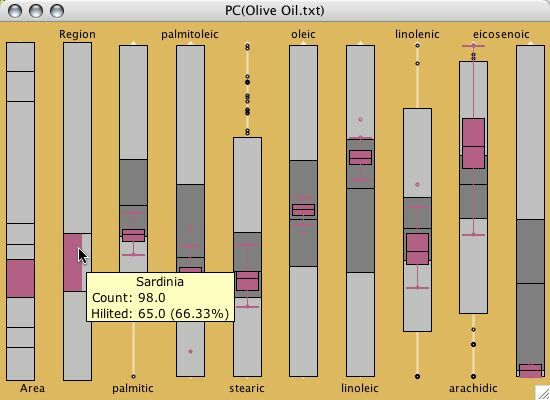 Data set on Italian olive oils. Several fatty acids were measured for oils from different regions. Data on tipping behaviour in a restaurant located in a shopping mall. See Quickstart as well. Please feel free to contribute your maps to share them with other users (make sure you don't violate any copyright and only submit maps that are in the public domain). The data files here are dummies, which connect to the ids in the map file and identify the polygons by region name or region id. > # Note that you get "brazil.txt" and the mapfile "MAP_brazil.txt"
We hope to grow the map library soon, so many Mondrian users can benefit from using maps in the public domain. There is also a collection of SHP-files at VDS-Technology. If you need help on Mondrian's short cuts, the "Reference Card" is the place to go. It can be accessed from the "Help" menu. 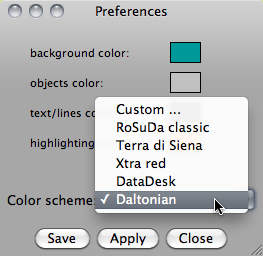 Mondrian features a preferences dialog, to set your favorite background and highlighting color. Five schemes are preset. If you have some other intriguing color scheme, please let me know and I'll add it. You may save your own customized scheme, if none of the defaults suits you. Changes in Version 1.0 as of 12/18/2008. Changes in Version 1.0 beta12 as of 08/29/2008. Changes in Version 1.0 beta11 as of 03/19/2008. Changes in Version 1.0 beta10 as of 12/16/2007. Changes in Version 1.0 beta7 as of 05/13/2007. Changes in Version 1.0 beta3 as of 10/31/2006. - selection order of variables in variable window is reflected in all multivariate plots! Changes in Version 1.0 beta1 as of 05/24/2006. - missing value plot can be used to investigate the structure of the missing values. Changes in Version RC 1.0m as of 11/29/2005. - Using 1.4.x JVM on all platforms. 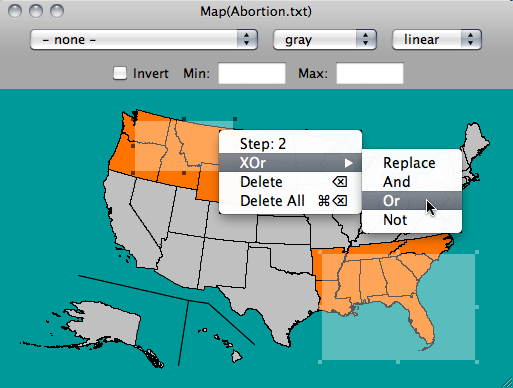 - '<-' and '->' can be used to change the saturation of boundaries in maps. 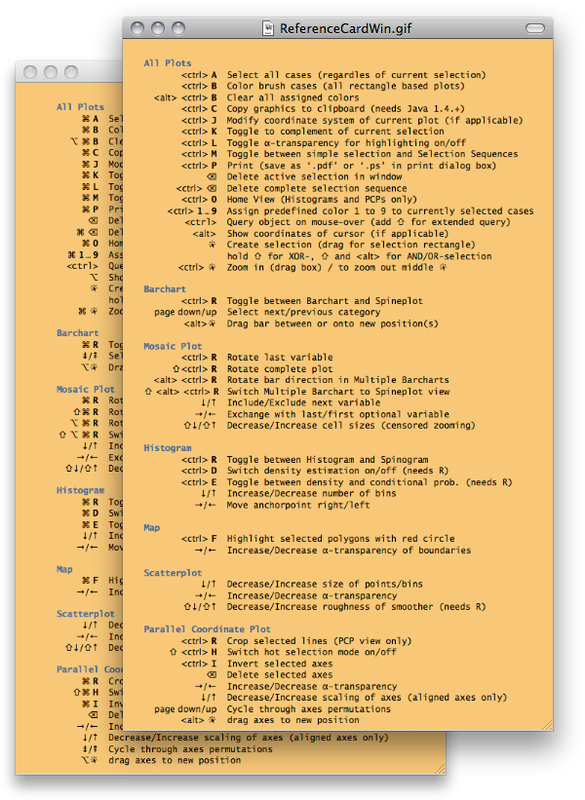 - "Boxplot y by x" is now a separate menu item. 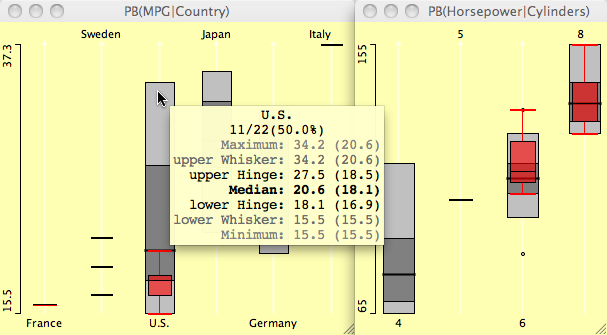 - Levels can now be sorted in boxplots y by x according to median or IQ-range. Changes in Version RC 1.0f as of 04/06/2005. - Queries are now implemented via ToolTips. 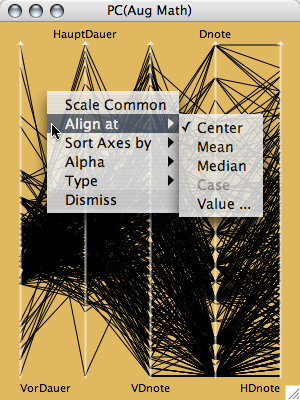 - Further improvements to Parallel Coordinate Plots. See section for details! 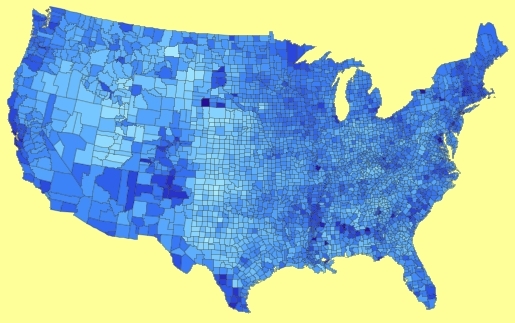 - Maps now feature six different color schemes for shading choropleth maps. 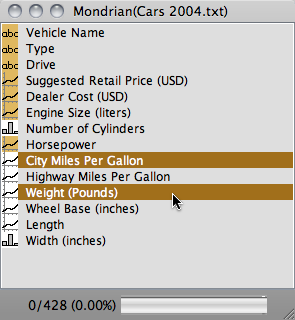 - Under MacOSX you can now drop files on Mondrian to start the application and load the data. 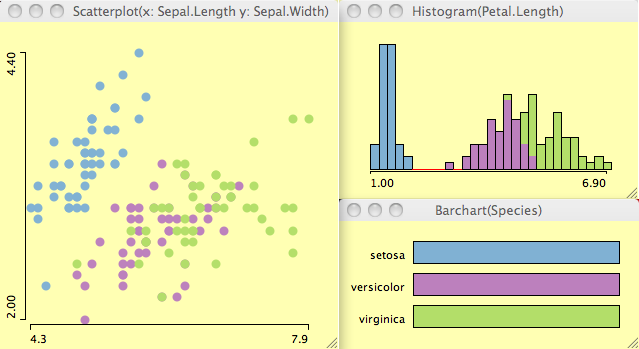 - Vast improvements to Parallel Coordinate Plots. Se section for details! - Printing works via <meta>-P in all plots. In MacOS X use "Preview" to save as PDF. - Additional sorting options in Barcharts. - Histogram parameters can now be set manually as well. - Choropleth maps can now be inverted and colored by rank. - Yet another update to the L&F of selection sequences. - an updated version of selection sequences. See the section for details. - Boxplots y by x. 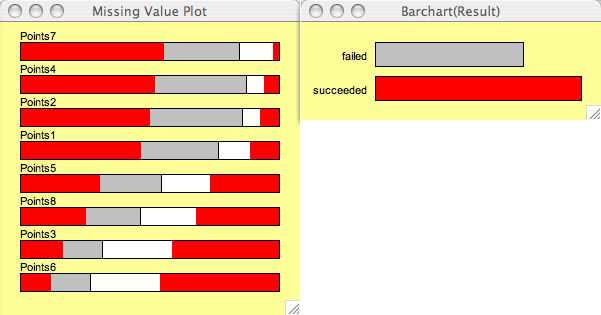 Just select a continuous variable and a categorical variable and choose 'parallel boxplots' in the plot menu. - Highlight color is now red! 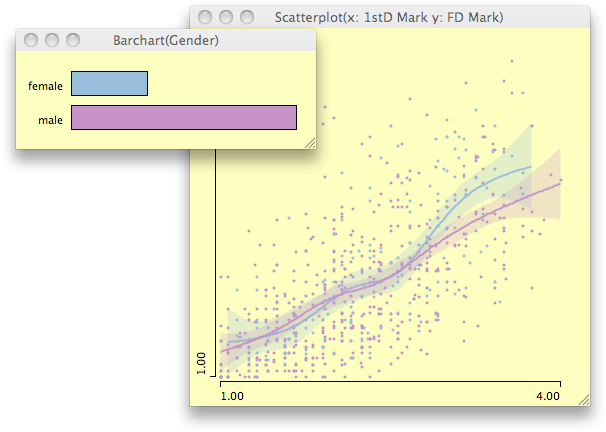 - Add lines in scatterplots by third variables to visualize paths and other relationships. 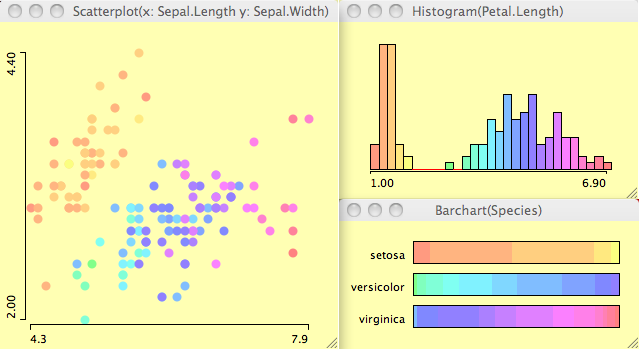 - alpha-channel works in scatterplots (use arrow keys to change) and parallel coordinates (via pop-up). Note: The JAR-file can be started by a simple double click. Within Windows, Sun's JRE or JDK must be installed (make sure that .jar files are not associated with any decompression application), Mac OS X users just smile. The best reference for citing Mondrian - apart from the website - is 'the book'. This is quite misleading and actually complete nonsense. You need to issue your administrator password. Note: This will not permanently change the application download option to 3 options. 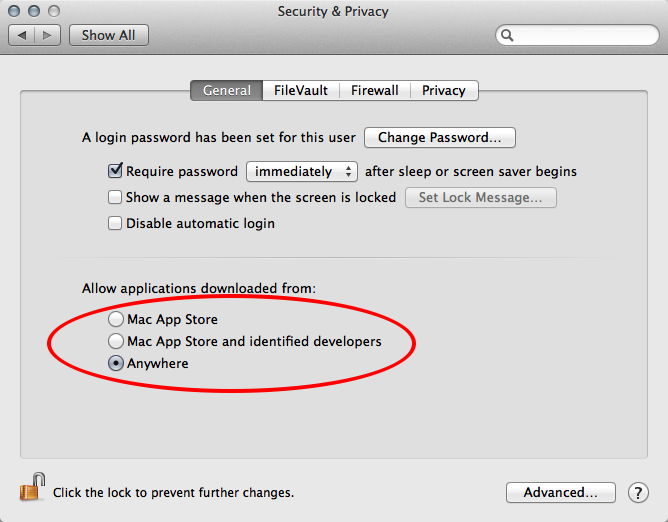 Once you copied Mondrian to your Applications folder and started it from there, you can go back to the preference pane and set the option back to "Mac App Store and identified developers", so you can profit from the higher security level. Getting a tiny warning message after starting Mondrian only indicates that there is no connection to R. This will NOT harm Mondrian in its core functionality - one can happily live without the R connection. Since version 1.0, Mondrian will start Rserve automatically under MacOSX, Windows and Linux. To start Rserve manually, see detailed instructions here. to start it manually. Sometimes you may get in trouble with an "old" Rserve server still running after an update of R and/or Rserve. The easiest way to solve this problem is a simple restart. there are empty cells in the file. Mondrian currently does not tolerate empty entries, you have to use "NA". When exporting from MS Excel, choose the ".txt" format (which is "tab separated columns" for recent MS Office installations). If your dataset is more complex or too large, you may do the similar "data cleaning" procedure using R. It is easiest when you use the JGR GUI, which has an "Open Dataset" menu item and allows you to save the file from the object browser. If you have your data in R already, you may use the "Open R data.frame" command from the file-menu. There is no application associated with the suffix .jar. To change this, follow these instructions. Once the application has been started, select "Options", "Settings". This tab lists all associated file types for the WinRAR application. De-select the "JAR" type and click "Ok". It may take another restart, to convince the system that things have actually changed, but this should do it. Please mail to either mondrian@theusRus.de or the mailing list stats-rosuda-devel, or submit your issue to the Bugzilla based bug-tracker. Topics of general interest will be posted on this page.